•Always measure with a steel tape measure. Never use a cloth tape. Measure sizes to the nearest 1/8 inch. Don‘t worry if your window measurements are uneven; this is fairly typical with windows. •Be careful about transposing measurements. Be sure to always have width and height clear marked. Remember, always put your width measurement first, and height last (W x H). •The Home Depot shutters ship with frames, which makes mounting easier. There are a number of louver sizes available for custom plantation shutters. The size of louver you pick will depend on what style you want for your window. Choose from 1 7/8, 2 1/2, 3 1/2 and 4 _ inches. Larger louver sizes help give your window a more modern, contemporary look, as they also preserve more of an unobstructed view when you open the louvers to look outside. A smaller louver size helps lend a more traditional design to your window. This project guide highlights measuring for an inside mount and measuring for an outside mount. Welcome to our shutter installation video. Please watch as we show you the correct procedure for measuring for trouble-free operation. When measuring for an inside mount application, it is important to check the depth of the window before choosing a louver size. Louvers can be 2 1/2 or 3 1/2-inches wide. It is important to look for any obstructions, such as locks, window cranks, latches, mullions and windows that open into the room. The frame options for inside mounts include L-frame, Z-frame, trim frame or unframed. Once the appropriate louver and frame has been chosen, record these items on the order form. Check the window for squareness by measuring the diagonal points of the window, or by using a panel and placing it against all four corners. If the window is out of square by more than 3/8 inches, an outside mount application is recommended. Measure the inside width of the window in three locations: top, middle and bottom. Remember to always measure the opening at the point of the window where the shutter frame will be installed. Record the smallest or tightest inside measurement within 1/16 of an inch for width on the order form. Repeat the same process for measuring height. Again, measure in three places: left, center and right. Record the smallest or tightest inside measurement this time within 1/8 inch for height on the order form. When measuring for an outside mount application, many of the same principles for an inside mount application apply. Similar to an inside mount application, check for window depth. The difference with an outside mount is that you can extend or build out the frame by adding depth where needed. Look for any obstructions, such as locks, window cranks, latches, mullions and windows that open into the room. The frame options for outside mounts include L-frame, casing frame or mounting strip. Once the appropriate louver and frame has been chosen, record these items on the order form. Measure the width in three places. These measurements should be taken from the left outside edge of where the frame will be positioned to the right outside edge where the frame will be positioned. Note on an outside mount application, you have the option of placing it on top of the window trim, in place of removed trim, or on top of drywall returns. Record the largest measurement within 1/16 inch of the width on the order form. The same rule applies to measuring the height. Measure in three places: left, center and right to the outside edge of where the frames will be positioned. Record the largest outside measurement this time within 1/8 inch for height on the order form. 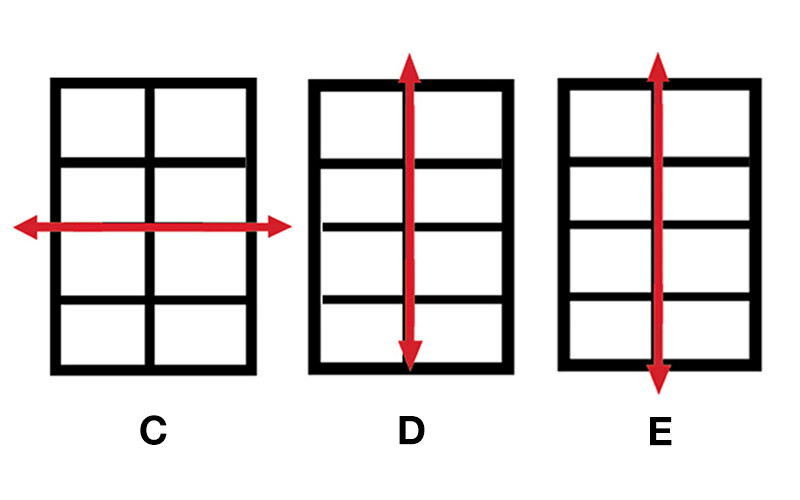 Measure the width of your window at the three positions indicated in Illustration A: top, middle and bottom. Record the narrowest width of the three. 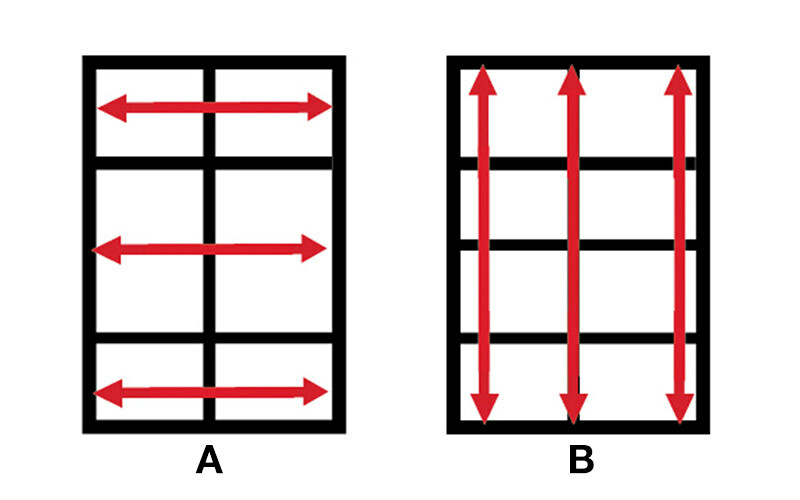 Measure the height of your window at the three positions indicated in Illustration B: left, middle and right. Record the shortest height of the three. Measure the width of your window at the position indicated by Illustration C. Be sure to add at least 1 inch to both sides so that the shutters can hang properly. If you have a sill that extends at the bottom of the window, measure height at the position indicated by Illustration D: from the top of the sill to at least 1 inch above the window. If you do not have a window sill, measure height at the position indicated in Illustration E. Be sure to add 1 inch to the top and bottom of the height measurement so that the shutters can mount properly.